Academics often do too good a job of staying out of the news, especially in this country. Sometimes, however, they stray from the ivory tower and into the news. After being photographed next to Syrian dictator Bashar al-Assad late last year, Tim Anderson from Sydney University started reading his name in The Australian a little more than a lecturer in political economy would consider normal. Just days after leaving Syria, Chris Kenny wrote for our national daily that Anderson, an “extremist boffin”, was an Assad sympathiser. Liberal Party backbenchers, and our esteemed Education Minister, joined in. They demanded that the University of Sydney, where Anderson teaches political economy, have more business sense and cull some of their more outspoken activist-academics. Stephen Garton, the university’s provost, then delivered him a backhander. He wrote an op-ed for The Australian defending the academic’s right to the “cardinal principle of free and open enquiry” before distancing himself from Anderson’s “naïve, even wrong-headed” views. Anderson describes the criticism as unfair, but not unsurprising. He had gone to Syria on a fact-finding mission, not with the intention of absolving Assad of accused war crimes. But he didn’t expect The Australian or Garton to appreciate that. Anderson says Garton didn’t speak to him about his trip to Syria or its intentions before publishing an op-ed on the subject. The journalist from The Australian asked him one question over the phone before hanging up and sending the article to his editor. It was a bit strange to sit in a café with someone who has had tea with Bashar al-Assad. An hour into our discussion, it is hard to believe that Anderson chaired a meeting at which the Syrian President was present. He had restructured the space we were sitting in. He reached behind him for chairs to rest his arms on. Speaking thoughtfully, but never directly, he talks off a point, rather than on one. A question about development in Papua New Guinea becomes, if you give it five minutes and a bit of space, an answer on corporate corruption in South America. Anderson has been teaching at the University for over a decade now. But it didn’t seem likely that he’d end up teaching in an academic institution after flunking subjects and dropping out in the early 1970s. He had arrived at the University of Melbourne while Australian soldiers were still stationed in Hanoi. And like so many students of that era, Vietnam awakened his social consciousness. He was involved in hiding fellow students who had been conscripted in the offices of the student union. It was also in Melbourne that he had his first interactions with the police. At a small student demonstration, Anderson remembers, “cops beat the crap out of us.” That arm of the state would, tragically, come to define much of the next decade of his life. 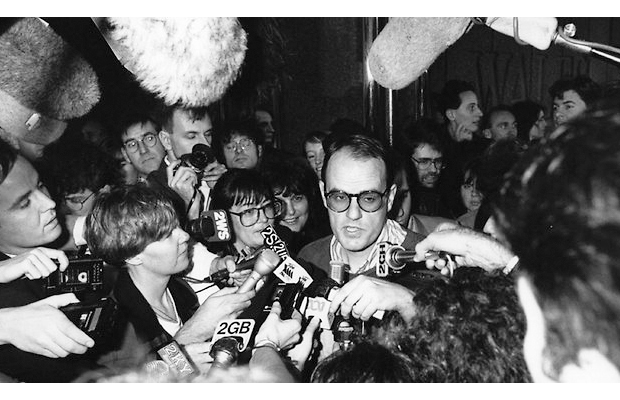 Arrested and charged for suspected involvement in the bombing of the Hilton Hotel in Sydney in 1978, Anderson spent seven years in prison before, after a lengthy appeals process, the state apologised and let him out. The idea of the ‘justice system’ is somewhat ironic, Anderson wrote upon his release: “the police don’t believe in justice: they believe in goodies and baddies. “I mean it was a political education – the whole thing”, he told us. He did not want to allow himself to become another casualty of the system. He completed his degree in prison, wrote an honours thesis and, after his release, became a doctoral candidate. And yet, even after seven years of false imprisonment, after seeing people beaten and broken by jail, Anderson did not go quietly into the academy. In 1985, the year he walked free, he was arrested twice – both times at anti-Apartheid rallies and sit-ins. His academic pursuits have never precluded or discouraged him from activist fights. Receiving his Arts degree while sitting in a cell is an instructive image as Liberal backbenchers queue up to slander Anderson’s Syria trip. Anderson’s roles as an educator and an intellectual were of limited interest to The Australian. Critical perspectives rarely sell conservative newspapers. If they had bothered to ask, they would have discovered that Tim is vocal critic of the “autistic” nature of Western education systems. He contends that the strong vocational emphasis of tertiary institutions ignores the importance of an education based on values. The outcome of which, he warns, would be a generation of uncritical graduates. Perhaps, he suggests, we have forgotten “the difference between being instructed and educated”. This position speaks to Anderson’s broader worldview. He resents the monopoly which the Western world claims on ‘civilisation’. “There’s a lot to learn from other cultures,” he seems to say every few minutes in our interview without any loss of sincerity. This worldview is, however, coloured by an unceasing dissatisfaction with Western, and in particular American, paradigms. And that is how he understands the world – in the broad brush strokes of ideas and cultures. In our interview he rarely talks about people unless we mention them specifically. He is fascinated by cultural discourse and global political currents, but not by individuals. Anderson has spent much of his academic career learning from parts of the world which have escaped the Western gaze. His research interests range from customary land tenure in Melanesia to the Cuban-East Timorese Doctors exchange program. Wherever he goes, however, Anderson clearly feels a strong moral obligation to pursue the praxis of his ideas. Last year, he weighed into the debate about the United States Studies Centre at the University of Sydney with an article written for Honi. He penned an open letter to Kevin Rudd about aid to East Timor in 2008. And – daily, it would seem – his articles on military interventions and the myopia of the media appear in niche newspapers around the world. This is the position of a man who is unashamedly political. He is boldly critical in a way that conservatives loathe. The Australian’s Chris Kenny considered it “scary to think Tim Anderson is paid by taxpayers to teach kids about politics and economics”. From a man who tweets more often than he thinks, this seems rather a compliment.